They may party like it's 1995, but 2015 might just be the year of Speedy Ortiz. The year 1995 was a good one, maybe indie rock's best. It was a year that yielded some of the genre's most challenging work, exemplified by Pavement's wily Wowee Zowee, which felt like the product of a band freed from earlier expectations that indie was going to be the next grunge. And while 1993 is often cited as the date of college-rock's sexual revolution, 1995 ended up launching more revolutionary feminist-rock salvos, be it P.J. Harvey's operatic To Bring You My Love or Helium's archetype-heavy The Dirt of Luck or even Sleater-Kinney's earliest recordings. Then there was modern-rock's British invasion with Elastica and Pulp, as well as strong showings by mainstays like Sonic Youth, Superchunk, and Kim Deal with her Breeders-hiatus project the Amps. So why dig up a 20-year-old time capsule when discussing a band as current as Speedy Ortiz? It's because the Massachusetts buzz band's sophomore outing Foil Deer sounds like it would've fit in very well with the Class of '95, considering its most apt analogues are of that vintage. Mid-'90s reference points might offer the most accurate means to describe Foil Deer, an album that brings to mind something along the lines of Kim Deal or Bettie Serveert's Carol van Dijk fronting a slack-rock band with Pavement's detached cool and a touch of Weezer's bemusement. Take, for starters, "Dot X", on which MFA-pedigreed frontwoman Sadie Dupuis offers up a pretty good approximation of van Dijk guesting on a Wowee Zowee outtake, as her wordplay-rich lyrics saunter to woozy guitar lines, or "Homonovus", which starts out wobbly like a Pavement deep cut before it rounds into shape to a crunchy guitar-and-keyboard riff. Better yet is the pre-release single "The Graduates", where Dupuis puts the college in Speedy Ortiz's take on college-rock: Channeling van Dijk's wistful delivery and flattened vocals, Dupuis evocatively paints scenes from the lives of lovable losers -- "French club dropouts" and "law school rejects" -- whose real-life equivalents can relate when she bemoans, "I was the best at being second place", whether she's talking about post-grad options or romantic pairings-off. Counterintuitively, though, it's Speedy Ortiz's complete lack of anxiety over the anxiety of influence -- after all, Dupuis was once in a Pavement cover band called Babement, and Speedy Ortiz has toured with the Breeders, Stephen Malkmus, and Mary Timony's Ex Hex -- that has actually helped the group create a distinct profile compared to its contemporaries. You notice how Speedy Ortiz embraces what came before it in order to take the next step on Breeders-indebted numbers like "Puffer" and "Swell Content". On those tracks, Dupuis and company span broadly divergent poles, from the undercover groove of "Puffer" to the joyfully quirky pop of "Swell Content", opening up their own musical palette in the process. The rhythm-oriented "Puffer", in particular, is a revelation, as it struts with an easy cool that adds a sly and sleek dimension to Speedy Ortiz's typically off-kilter approach. Likewise, "My Dead Girl" recalls just enough of Elastica's alt-wave in its more toned-down moments to bring in a sense of style that gussies up Speedy Ortiz's typically rough-hewn Amerindie sensibility. What's most promising about Foil Deer are the moments when you realize that being a follower of a tradition has emboldened Speedy Ortiz to be a leader in a new scene, which is maybe the point when Dupuis announces she's the "captain, not a crony" on the statement-making single "Raising the Skate". The song's gamboling guitars tumble and stumble but always land on solid ground, providing enough of a foundation for Dupuis' best sloganeering as she takes up the feminist-rock mantle from the likes of PJ Harvey and Mary Timony. 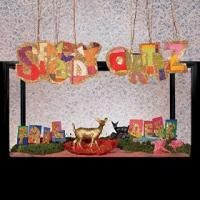 And indeed, it's thematically that Speedy Ortiz separates itself on "Raising the Skate", as Dupuis takes her turn fighting battles that have remained stubbornly persistent, but in her own updated way with a new vocabulary, like how she riffs off pop culture memes and touts, "I'm not bossy, I'm the boss." On the flipside, the gently swaying "Mister Difficult" may be Speedy Ortiz at its most fragile, but it doesn't fall apart and hangs together with a resilient strength, as Dupuis tests dysfunctional gender dynamics by turning their roles inside out ("Boys, be sensitive / And girls be, be aggressive"). Maybe Foil Deer doesn't quite sustain that edginess all the way through, like when the meandering guitars and wandering wordplay fade on the slower moments of "Zig" and the out-of-steam closer "Dvrk Wvrld". But there's enough on Foil Deer to show that Sadie Dupuis and Speedy Ortiz can be the captain and the boss of this generation of indies. In the end, it's really 2015 that's Speedy Ortiz's year, the time that they get to prove they're more than just the best at being second-place.